Understanding the impact humans have on environmental change was the focus of this year’s Intensive Summer Course “Advancing Disaster Risk Reduction to Enhance Sustainable Development in a Changing World” at the United Nations University Institute for Environment and Human Security (UNU-EHS) in Bonn, Germany. From the 1-12 June, the course offered participants the opportunity to deepen their knowledge of vulnerability and resilience in the fields of disaster risk reduction (DRR) and climate change adaptation (CCA). Thematically, the Intensive Summer Course was divided into different blocks, such as The History of Risk and Vulnerability Research and Why ecosystems matter for DRR and CCA. Other thematic blocks covered legal frameworks concerning climate change, and the challenges and opportunities that the use of technology brings to the field of DRR. The participants also had the unique opportunity to attend the UNFCCC Bonn Climate Talks 2015. Dr. Fabrice Renaud and Dr. Matthias Garschagen opened the course by emphasizing the need to recognize humans as a part of nature and understand the influence humans have on environmental change. Dr. Renaud discussed the role humans and ecosystems play in coping with the impacts of climate change. Dr. Garschagen noted how this interplay unfolds in a similar manner in both urban and rural areas. He exemplified the problems that arise for both rural and urban areas, when “a whole city centre is destroyed, when hospitals collapsed and the energy supply is threatened”, so that social services cannot be offered anymore, neither in rural areas, nor in urban centres. Focusing on coastal areas, Dr. Renaud invited participants to discuss case studies and elaborate on the effectiveness of technical solutions and natural solutions towards flooding. The interdisciplinary approach of UNU ensures that hybrid solutions were explored and findings from various scientific fields were presented to engage the participants in lively discussions about the opportunities to enhance human security. Using specific examples concerning the ecosystems in Sub-Sahara Africa, the participants discussed in groups the need to preserve people’s livelihood despite increasing drylands and how to better support them. In order to adequately react to these challenges, the lecturers presented measurement tools, such as the Water Poverty Index (WPI). On the basis of these measurements, eco-based disaster risk reduction (eco-DRR) and ecosystem-based adaptation (EbA) measures can be applied. Bonn, Germany. Photo: ©UNU-EHS/Malak Qamhieh 2015. All rights reserved. The human equation has made it more challenging to define which hazards are completely natural and which ones are man-made. Although there is apparently no clear boundary, E-waste was presented as an example of a solely man-made environmental damage. Dr. Feng Wang from “Sustainable Cycles” (SCYCLE), an operating unit of the United Nations University Institute for the Advanced Study of Sustainability (UNU-IAS), gave an overview of the rapid increase of e-waste in many parts of the world, and the social and economic challenges that come with it. The boundaries are more blurred when the discussion shifts to climate change. However, whether natural or man-made, climate change threatens the livelihoods of thousands of people all over the world. Lecturers Dr. Cosmin Corendea and Andrea Milan presented the rights-based approach and the findings of recently conducted research on climate change induced migration. Mr. Milan drew the participant’s attention to how to scientifically measure qualitative concepts, such as human mobility. Dr. Corendea explained legal practices concerning ‘hard law’ and ‘soft law’ and held a stimulating discussion on the legal status of people, territory, international relationships and the government of a nation amid rising sea levels and increasing storms. Focusing on adaptation to climate change, Dr. Koko Warner drew the participants’ attention to the concept of loss and damage. The concept focuses on “the climate change impacts that we are unable to prevent through mitigation and adaptation efforts.” Acknowledging that the frequency of weather-related hazards will grow in the future, adaptation patterns are unlikely to be sufficient in many cases for countries and communities to protect their people and goods. The approach of loss and damage strives to offer justice and assistance to those facing residual loss and damage. Mr. Michael Zissener and Ms. Kristina Yuzva Clement presented The Munich Climate Insurance Initiative (MCII) that deals with how to cope with climate change related hazards. As a part of their presentation they engaged participants in simulated role play to help them realize how insurance can contribute to the ability of communities, countries, companies and individuals to better cope with the threats of climate change induced hazards. Besides qualitative ways to measure and describe environmental risks and climate change, Dr. Jörg Szarzynski and Dr. Yvonne Walz provided course participants with insights into Remote Sensing (RS), Geographic Information Systems (GIS) and other geospatial technologies. Dr. Walz elucidated how information gathered through GIS and RS technologies can be used to study the patterns, causes, and effects of health and disease conditions in defined populations. With reference to her own research on schistosomiasis (a disease caused by parasitic worms ) in West Africa, Dr. Walz illustrated how GIS and RS technologies can be used to identify the prevalence of a human disease. Dr. Szarzynski elaborated on the use of early warning systems based on GIS and RS. He talked about safety and security regulations as well as disaster assessment and coordination within the UN system. He also gave participants a detailed impression of the use of early warning systems and the need for improved preparedness strategies and also spoke about practical barriers that can arise due to national legislations, for example when a hazard is about to occur but national governments are not able or willing to intervene. 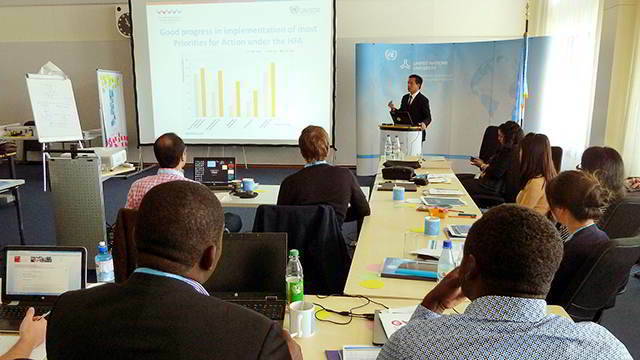 In addition to UNU-EHS lecturers, four additional speakers were invited to the UNU-EHS Intensive Summer Course: Dr. Jerry Velasquez, the Chief of Advocacy and Outreach at the UN Office for Disaster Risk Reduction (UNISDR), Luna Abu-Swaireh, the Climate Change Coordinator and Liaison Officer at UNISDR, Dr. Saleem Ul Huq, the Director of the International Centre for Climate Change and Development (ICCCAD), and Dr. Jürgen Clemenes, Project Manager at the German Committee for Disaster Reduction (DKKV). Dr. Velasquez and Ms. Abu-Swaireh shared their experiences of working within UN procedures and the position of the United Nations. While Dr. Huq and Dr. Clemenes talked about the achievements and drawbacks of the recent Conference of Parties (COPs) and the upcoming World Humanitarian Summit 2016 in Istanbul. The four external speakers approached the topics of climate change, vulnerability and DRR from various points of view. The diversity of the presentations demonstrated the complexity of these topics. In order to provide a holistic approach combining both theory and practice, Dr. Szarzynski facilitated a hazard simulation exercise. 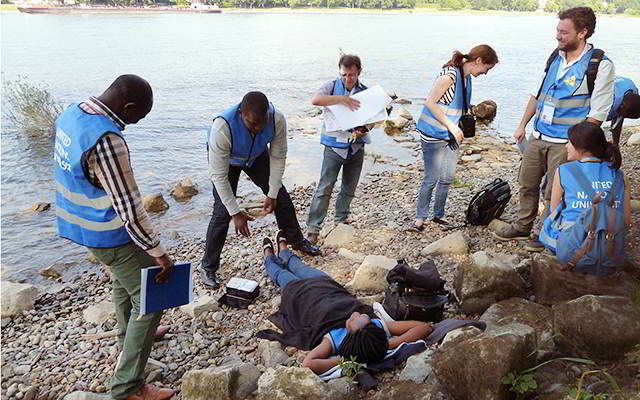 Participants gained hands-on knowledge about emergency response and emergency management by developing realistic solutions to cope with heavy flooding of the Rhine river in Bonn. Based on their academic or professional backgrounds participants were split into different groups and tried to develop a theoretical overview of possible solutions to the problem. Then, they went out to the field to familiarize themselves with the hazard. Throughout the exercise all teams had to communicate with each other and a fictional “On-site Operations Coordination Center” (OSOCC), similar to those applied by UNDAC teams (United Nations Disaster Assessment and Coordination), an emergency response mechanism of the UN managed by the “Office for the Coordination of Humanitarian Affairs” (UN OCHA) during sudden-onset disaster involving international relief resources. Participants had to use GPS devices to geo-reference field teams, find specific locations, and map areas of interest. After the fieldwork, the groups had to provide their findings and recommendations for action in short and precise presentations and reports. Bringing together ambitious students, scientists, and practitioners from all over the world is an essential part of the UNU-EHS Intensive Summer Course. Altogether 20 graduate students, PhD candidates and practitioners from 14 different countries participated in the course. Congenial to the interdisciplinary approach of UNU-EHS, the participants’ professional backgrounds were diverse, covering many fields from physics to tourism. Find out more about UNU-EHS’ Intensive Summer Course.